All athletes must attend check-in with photo identification. Teams comprised of 2 males and 2 females are highly encouraged to check-in at the same time but may check-in separately. There will be additional paperwork that will need to be completed prior to the Main Event in-person. Please email info@midatlanticcrossfitchallenge.com for any questions or concerns. *The Universal South Garage is accessible from Florida Avenue. Athlete Briefings are MANDATORY and attendance will be checked for all athletes competing at the Main Event across all divisions. Failure to attend will result in disqualification from the Main Event. 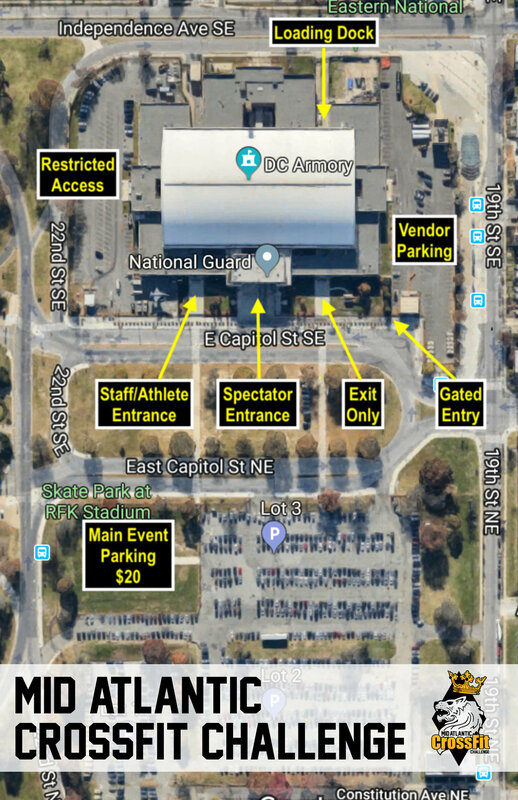 Please note that all athletes must check-in at the Washington Hilton to receive their credentials and other pertinent registration materials prior to entering the DC Armory. Athletes will be required to go through the Athlete Entrance.